I wanted to share how I make the hair for my amigurumi. I always wished that someone had shared this information when I was first getting started, and I searched high and low for a couple of months before deciding on a way that I wanted to make the hair. One of the reasons I like making hair this way is because I like that it doesn’t create a massive amount of bulk, and yet doesn’t look like the doll is bald either. I’ll try to include images of both boy and girl hair, and to make it easier to distinguish between the two I’ll use images of my light skinned brown haired boy, and then for the girl I’ll use the images of my olive skinned black haired girl. I’m not necessarily the best at writing understandable instructions for everyone, so I’m including a large amount of images so that hopefully those of you that tend to be visual learners can easily understand as well. I think in order to keep it simple I’ll write out the instructions first and then just have all the images afterwards; if there is something that I think is of particular importance I’ll annotate an image. For all my instructions, the rounds are *not* joined, using a stitch marker, place it in the first stitch of each round to know where to begin the next round. 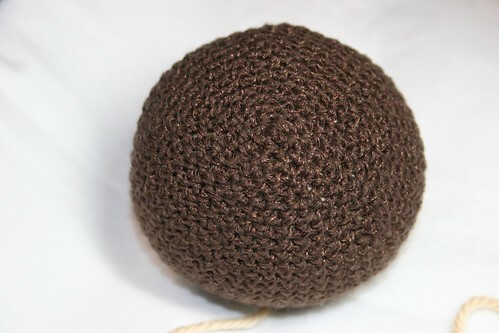 Additionally, you should know how to make an adjustable ring to begin both the head and hair, if you don’t know how to make one there are plenty of crochet stitch guides/dictionaries/books that have instructions, as well as online, one example is here. 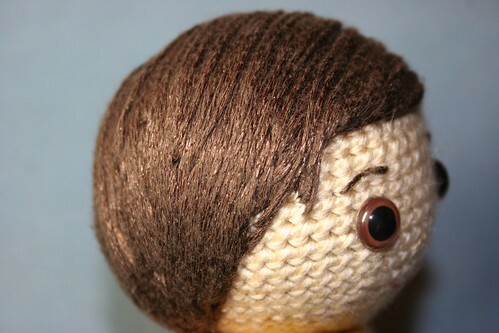 You’ll need yarn in two colors, for the head and for the hair. 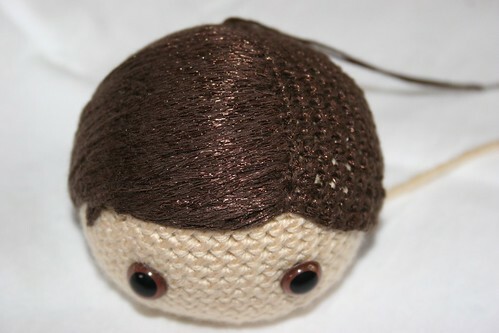 Additionally, you’ll need a yarn needle to sew the hair to the head, and embroider the hair/yarn to the wig cap. And to not forget anything, have polyfil/stuffing handy to shape the head, and craft eyes if you plan on using them for your doll. 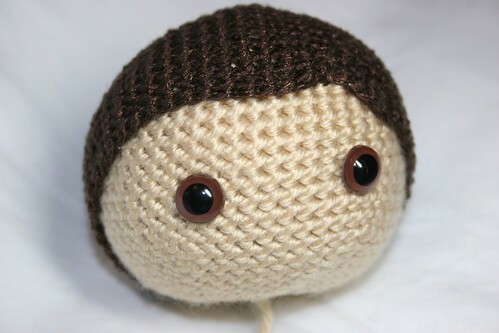 To make the hair for an amigurumi, have the head already made. I like to work with 5’s since for me they’re a lot easier to increase and decrease mathematically. For this example I’ll use a head size with the diameter being 50 sts in the largest round. The head will be increased by 5 to be 50 sts at it’s widest, so rounds 1 – 10 will increase from 5 to 10 to 15 to 20…. up until you reach 50 in round 10. Make rounds 11 – 20 50 sts in each round, and then began decreasing rounds 21 – 27 by 5 sts each round so that it goes 45 to 40 to 35 to 30…until you get to 15 sts in round 27. (Of course all this is just for explanatory purposes only, and you can make the heads whatever size you’d like, I’m just including head dimensions so that it’ll be easier to understand the hair instructions.) At this point I usually fasten off the end and leave around 12 inches of yarn to sew the head to the body at a later point. Now, making the hair cap is essentially making another head without the decreases. Using the color you’ve decided upon for the hair follow the same directions for the head, just with a slightly looser gauge. Round 1- Make and adjustable ring and sc 5 sts- 5 sts. Round 2- 2 sc in each st- 10 sts. Round 3- [sc 1, 2 sc in next st] 5 times- 15 sts. Round 4- [sc 2, 2 sc in next st] 5 times- 20 sts. Round 5- [sc 3, 2 sc in next st] 5 times- 25 sts. Round 6- [sc 4, 2 sc in next st] 5 times- 30 sts. Round 7- [sc 5, 2 sc in next st] 5 times- 35 sts. Round 8- [sc 6, 2 sc in next st] 5 times- 40 sts. Round 9- [sc 7, 2 sc in next st] 5 times- 45 sts. Round 10- [sc 3, 2 sc in next st] 5 times- 50 sts. Rounds 11-17- sc in each st around- 50 sts, fasten off and leave a longish tail for sewing the hair to the head. For me, this size wig cap is sufficient for this size head, especially since I like to have a little more room to shape the hairline by embroidering the hair to resemble someone’s actual hairline with bangs, or sideburns, etc. Now is where it begins to get more creative. Determine where you’d like to place the hair, usually it helps to experiment with eye placement at the same time. 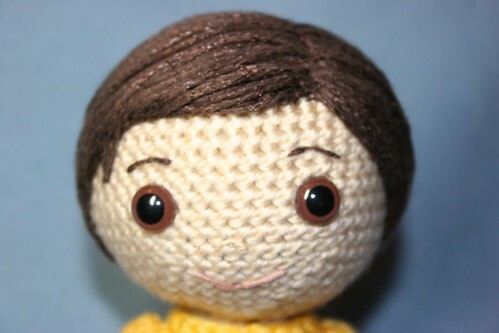 I don’t fasten the craft eyes to the head until I’ve seen both where the hair is going to be and I’m comfy with how the eyes give the doll an expression. Once you’ve made that decision it’s time to sew the hair to the head. 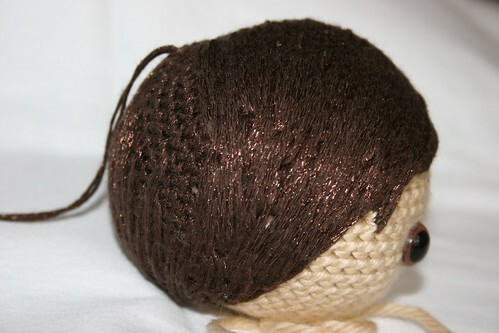 Using the aforementioned tail, as well as a yarn needle, sew the perimeter of the wig cap to the head. This is really the only place that I attach the wig cap the the head, it’s proven sturdy enough and there’s no need to make this more time consuming than necessary. 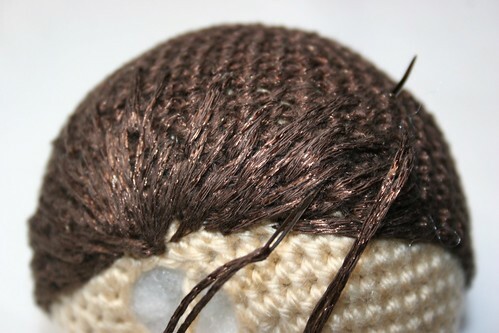 Sometimes when you’re embroidering the hair onto the wig cap you’ll catch part of the head underneath the wig cap with the needle, its no big deal and if you’re worried about the wig cap coming off of the head, this’ll be an additional method of security. 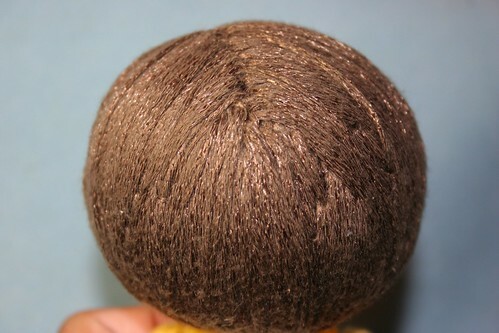 You can use the remaining yarn on your needle to start embroidering the hair, or else just weave it into the head/wig cap to get to the next part. 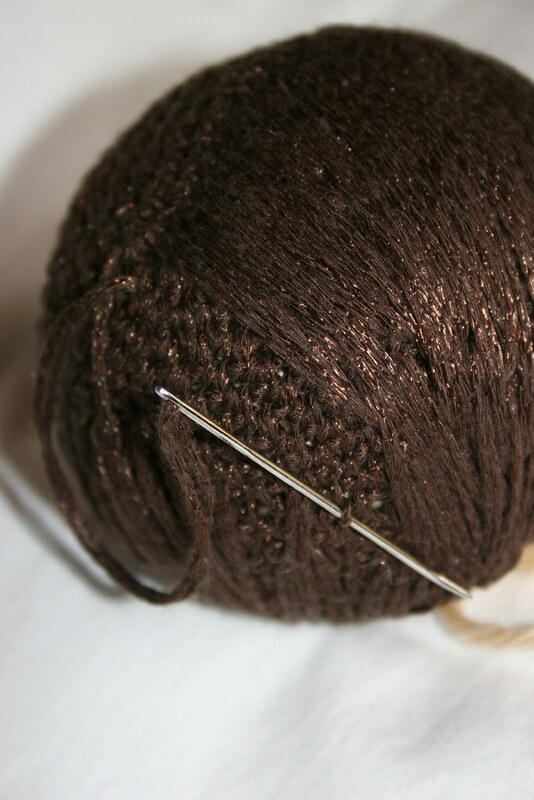 Another tip is that after you’ve pulled a length of yarn to use to embroider the hair, pull the yarn so that the needle is at the halfway point of the length of yarn. You’ll use the same amount of yarn to make the hair, but it’ll be thicker and faster when you double the yarn on the needle. 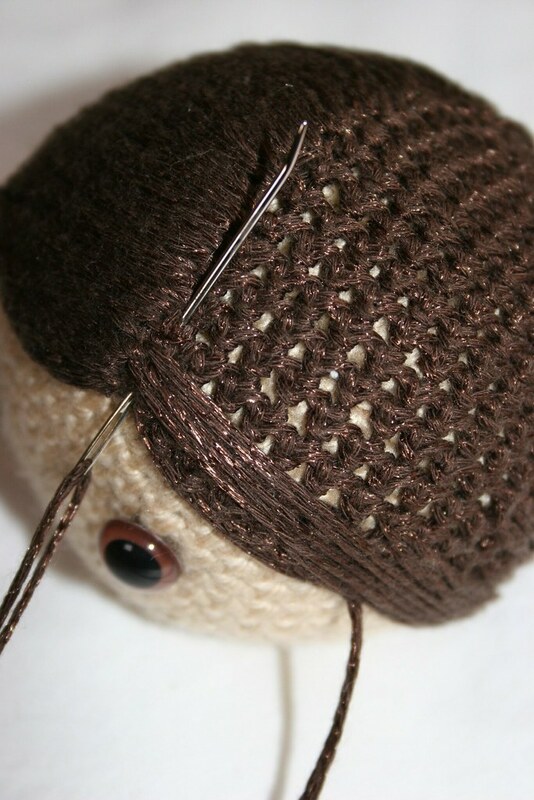 Since the head isn’t attached yet to the body when you start a new strand or double strand of yarn, you can tie a knot to keep it from coming loose and then pull the needle up through the head. Or you can just do what most embroiderers do and not knot it with the intention of it being secured eventually by just going over the yarn with your stitches. I tend not to secure it, partly because it’s an additional step, and partly because I have a 3 year old and 1 year old who both play and pull and I’ve never had any issues with hair coming loose. Though, as I’ve said before, it really is all up to you and your comfort level, if you’re making it for someone younger or who you think will pick and pull at it, then by all means knot away! Whether you’re making a boy or a girl will determine whether you’ll want to part the hair, or where you want to part it. 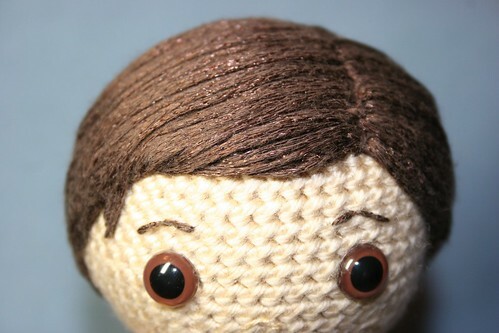 With masculine hair I tend to keep it shorter and just have a small side part, I also begin by embroidering the back of the head with short stitches, working my way up the head so that it looks like the hair/yarn at the top of the head is laying on top of the hair lower down the head. I do this across the back of the head. Then as I begin to get higher I take a break doing that and move to the top of the head where I’ve decided upon the part. 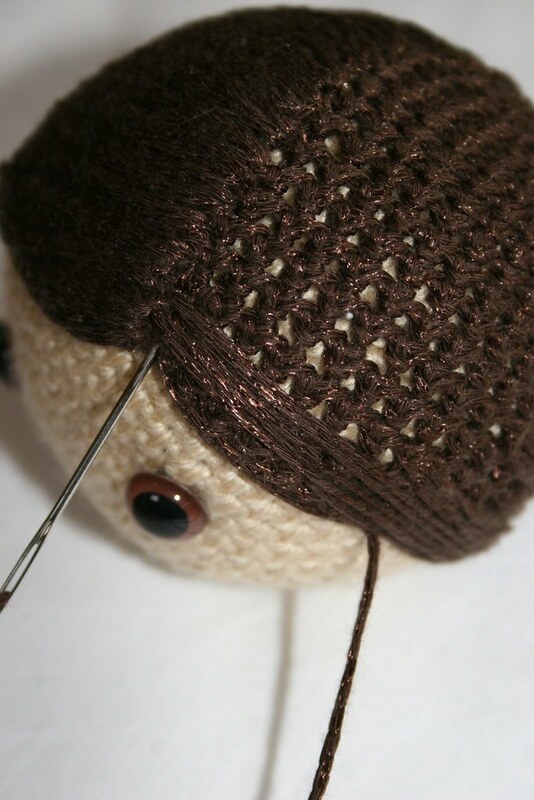 Here, I start using longer stitches, and make the hair part evident by embroidering up and down the head with the yarn always going along the same line up at the top of the head indicating a hair part. I think what I’m talking about now will be better illustrated by the images. Once you’ve filled in the hair as much as you like, you can add embellishments like little bangs or sideburns by just embroidering a bit more in the front, and that way it also covers up the edges of the wig cap as well. For the girlish hair styles discussed in this tutorial I keep it close to the head with either a ponytail or pigtails or braids. For a ponytail you just embroider the hair in the direction of where you want the hair around the head to gather to be tied. 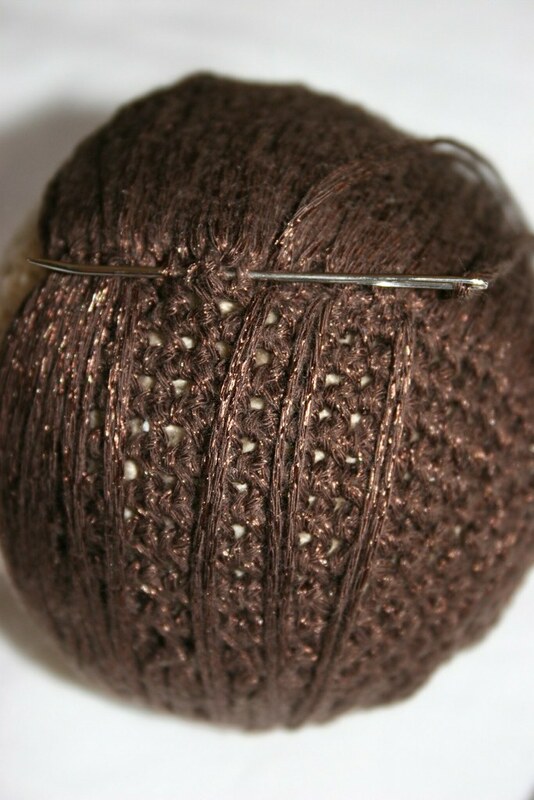 Do this back and forth until you’re happy with the results and weave in the end of your yarn. Now cut yarn in the desired length so that when it’s doubled it’ll be long enough to resemble two strands of hair pulled back in a ponytail. 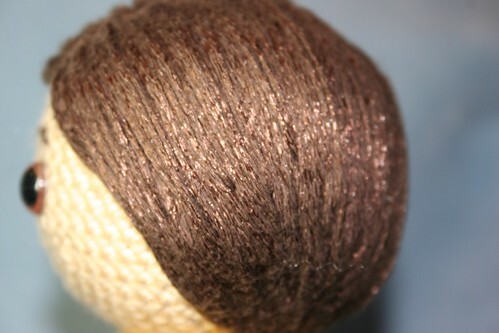 Do this with as many lengths of yarn that you need to have a thick enough ponytail for your liking. Using the yarn lengths that you’ve cut, string them through the hairline and then you can either knot them or leave them as they are, and then gather them into the ponytail. Fasten by either using a rubber band, or just a scrap piece of yarn to tie the hair back. For pigtails/braids it’s pretty much the same idea, except you’ll be embroidering the hair back and forth across the head to where either ear would be. When you’re cutting the lengths of yarn to finish it up, you still need to double the yarn to ensure that you have long enough lengths for the pigtails, and even a bit longer for the braids since they tend to shrink up the yarn with their bulk. I’ve tried to make this a comprehensive as possible, while getting the right details in, without confusing you even more. If you’ve anything to add, please do so by leaving a comment, I’ll try to respond to those as timely as I can, and that way others with similar thoughts will be addressed as well, instead of having multiple emails with the same questions/comments. I hope this has been somewhat helpful for those of you interested in how I make hair for my own amigurumi, and I’d love if you’d leave comments/links with what you’ve made using this tutorial! Thanks a bunch for this. I can’t wait to try it out! Thank you so much for posting this! 🙂 I can’t wait to try!!! Your generosity in posting this and taking the time to write about it so coherently and in such detail is really amazing. And I appreciate it so much. I’ve always made hair caps, too, but just used that as the hair and didn’t go over it again with the embroidery. Duh! Thank you so much for your willingness to share. Thank you for such a detailed tutorial! And the pictures are excellent 🙂 May I ask what type of yarn you used for the hair in the example? Hey, thanks for the compliments! I do hope it is helpful, that was my aim. 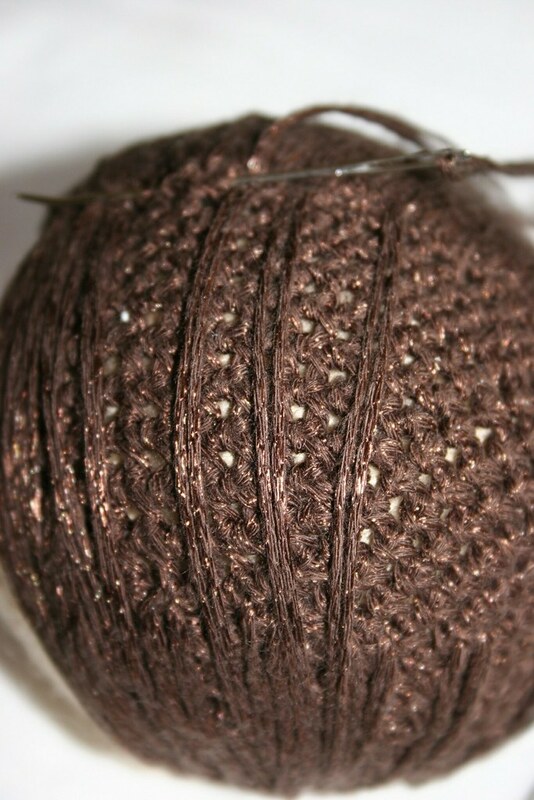 Murz- the yarn that I used is Bernat Cool Crochet in Chocolate (74013), don’t you love the little sparkle to it! Excellent tutorial! Thanks for that. 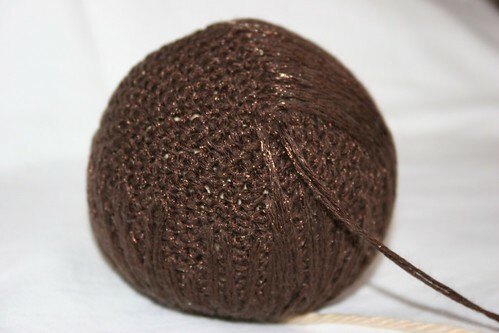 > the yarn that I used is Bernat Cool Crochet in Chocolate (74013), don’t you love the little sparkle to it! Thanks a bunch. I have been starting to create some of my own puppet patterns and need some good ideas for hair!! This is a wonderfully generous tut! I agree, I love the little sparkly-ness in the hair. Thank you. Thank you. You’re the best. How would you do the hair for something without its hair up? For example: The mermaid amigurumi you made.